Elsewhere in Managerville, Wigan have given Roberto Martinez permission to ay’ a chinwag with John Henry and the FSG boys though Alan Pardew, Jurgen Klopp, AVB, Paul Lambert and Didier Deschamps are all also being mentioned in passing this morning. The squad Dalglish inherited needed urgent reinforcements, and these were duly provided by new owners…but kenny fucked it up. And with FFP coming up, the new 25-man squad rules and the current state of transfer market pose a real problem for Liverpool. Add to the fact that their continued absence from champions league would force their best players (Suarez, Agger) to look for elsewhere. they were doing alright under martinez, and playing football under him. rogers carried it on, didnt create it. Sad days for Liverpool when the calibre of managers they are approaching are from clubs like Wigan and Swansea. This from a club with five European Cups. Tragic. 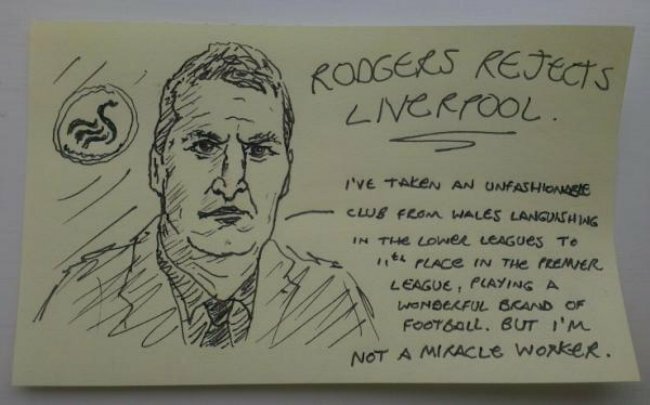 Rodgers is holding out for a return to Chelsea. Paul Lambert to get the Liverpool job. Bet you feel a bit foolish now, eh?